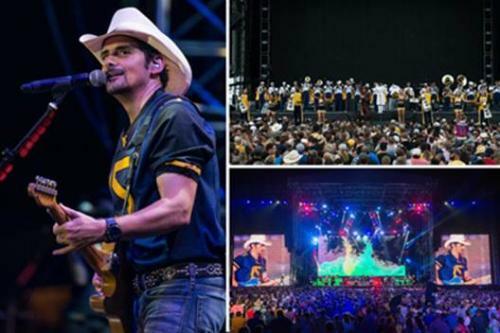 This past Friday night Brad Paisley continued with his Country Nation College Tour presented by Frontier Communications by going to his home state of West Virginia and providing a free concert at West Virginia University. Paisley referred to the gathering as a huge pep rally to support the WVU vs. Youngstown State football game that was on Saturday (and WVU won!). Special guest for the show was multi-platinum recording artist Chris Young. The concert was filmed by City Drive Films and is slated to air later this year as part of the new live concert and travel series titled "Landmarks Live in Concert." It will also be released as a DVD with a live CD component this Christmas. This coming weekend the Country Nation College Tour presented by Frontier Communications will travel to Ohio State University on Thursday, September 15. More dates will be announced soon.